To help “do my bit” and save our national bird, I volunteered to help set up, and look after some traps within the Whakatāne Kiwi Project area to capture feral cats. It’s a rewarding job that takes me into the bush regularly. The traps have to be checked every day as they are live capture traps. Any domestic or stray cats are taken to the SPCA so that their owners can be found. Cats are skilled predators, especially at night when kiwi are out roaming. They’re only following their natural instincts, however they can be devastating to the native birdlife in our reserves, including kiwi chicks. We encourage cat owners around Whakatāne to keep their moggies in at night. I am also working on a proposal for a small research study on predator-free Moutohorā (Whale Island) to study the breeding success of kiwi on the island. I work closely with Jamie Rhodes, John Black & Bridget Palmer helping to manage and support the volunteer stoat trappers, and the Bring Back the Birds volunteers filling bait stations along the Ōhope escarpment. I lead the planning and organising for wasp monitoring and control; and the use of PAPP to control stoats, including preparing any consent documents required for the toxin operations. I also undertake the quarterly rodent monitoring in the reserves and am involved in helping the WKT meet its health and safety obligations. The focus on pests is both satisfying and challenging. Satisfying to work with such committed volunteers keen to see pest populations reduced to low levels and the birds &amp; bush thrive. Challenging to find ways to reduce trap shyness and combat stoat reinvasion. So, what’s the Whakatāne Kiwi Trust doing with an IT Team you may ask? Before you get images of Sheldon-esque geek-types sitting in a darkened room coding through the night, being perpetually fed coca-cola and pizza, it’s not quite like that. It’s a team of one, me, and I don’t drink cola and I don’t eat pizza (much). When I first got invloved with the Project, I discovered that most of their data was stored at best in spreadsheets and at worst in small, easily flammable and even more easily lost, notebooks. Having worked in IT for …. let’s just call it a long time …. I realised that I could help them centralise and secure all their data. Thus was born the WebApp, a web-based application for storing volunteer, trapping and kiwi data. As well as building the WebApp, I have also been a trapper, assisted on Kiwi Night Walks, and am currently a ‘chick pinger’ and member of the Kiwi Management team. I can thoroughly recommend volunteering for the Trust. I have made some great friends through volunteering and it really has given me a sense of belonging in the local community. Be warned though, you may get sucked in. I started out volunteering for about an hour a week and now it appears to have taken over my life … in a good way! Anyway, better get back to coding…. where’s my pizza? I’ve been volunteering with the Trust since 2014(5)? As the marketing team leader, I help out with a range of activities that promote and advocate for Whakatāne kiwi. A large amount of my time is taken up by the Trust Facebook and website writing posts, sourcing content, and responding to comments. My camera is never far from my grasp and I’ve spent the last three years building a hi-quality library of images for the trust to use for marketing, promotion, advocacy, and education. I’m proud to note that one of my images of a Whakatāne kiwi chick now represents all NI brown kiwi on the IUCN Redlist. I work closely with the Whakatāne District Council to promote Whakatāne as “Kiwi Capital of the World.” I also help out with experiences such as the Night Walks and the Kiwi Celebrations. Kia ora koutou. My name is Donna Wensor and I am the Leader of a small team of volunteers who support Guus Knopers, our Dog Training expert, to offer to the community kiwi aversion training. We offer this training 4 times a year, (approximately every 3 months.) The training is however, not only for kiwi, as many people think. Guus can also train dogs, so that they do not interfere with whio, weka, pateke and even chickens. My job is to co-ordinate all the bookings and then to complete the paperwork on the day. If you would like your dog trained to keep away from specific birds such as chickens, you need to make sure to tell me when booking, as I need to let Guus know before the day, so that he can source the birds needed. This service is offered to everyone, not only hunters. We encourage those who live close to bush areas, or who take their dogs for long walks to get them trained. The cost is $10.00 per dog, and training only takes about 5 minutes. I have had the privilege of being part of the Whakatāne Kiwi Project team since 2009 when I was offered a secondment from my Department of Conservation (DOC) role in Rotorua. I was asked to manage the project, which I readily accepted – who wouldn’t want to live in the Sunshine Capital? My soon to be husband also lived here, so it wasn’t all about the sun and kiwi. My role changed within DOC and my time as Kiwi Project Manager finished, however I am still able to assist with training volunteers and overseeing kiwi management. I work in the Community Team and was recently assigned the District Predator Free 2050, Ranger role. This is an exciting challenge, one that links with the project vision of expanding the pest and predator efforts to cover 20,000ha. The Kiwi Project is very close to my heart and the iconic species living on our doorstep, the friendships I have formed, and the incredible environment have become a lifestyle. I am proud to say I volunteer for the Whakatāne Kiwi Trust as the Volunteer Coordinator, Kiwi Wrangler and Educator. The role I have played within the project continued to evolve. I still help with field work, but I now seek more opportunities to share my knowledge and our incredible ‘backyard’ inhabitants with the wider community. Who would guess that when I started with DOC 15 years ago, that I would enjoy ‘performing’ for a classroom of students or spending the night dressing up and helping with the Friday the 13th Ghostly Ghouls Night Walk! It is an honour to be called the Kiwi Lady and be a well-known figure in Whakatāne, and the kiwi ‘industry’ nationwide. I think I’ll always be involved in some capacity – I’m passionate about the Project and can’t imagine not being part of it. Juggling shift work, family life and numerous volunteer activities is all part and parcel for Whakatāne Kiwi Trust volunteer Jamie Rhodes. Jamie has volunteered for the Whakatāne Kiwi Trust since 2008, track cutting and monitoring trap lines. “I signed up as a Kiwi Trust volunteer 11 years ago. I am a shift worker at Fonterra and it was something to do on my days off. The Whakatāne Kiwi Project is a really good initiative to be involved in and it provides an opportunity to spend some quality family time together in the bush,” he said. Jamie’s mum and step dad have also become volunteers and are both valued members of the Kiwi Trust whanau too. Jamie, and wife Tracy, has two daughters – Emmerson and Jordyn – who often help out, undertaking many tasks like trap checking, kiwi monitoring and attending trust events. Averaging five plus hours a week, the Whakatāne Kiwi Trust volunteer work is a big commitment in itself – but it’s just one part of Jamie’s community involvement. He also volunteers for the Whakatāne Emergency Response team, the Rural Fire Force and the Urban Land Search and Rescue team. Jamie now has another tool in his predator control arsenal; the Kiwi Trust have recently bought a mustelid detection dog called, Teddy. Jamie and Teddy, the short, woolly parson’s terrier will soon be a common sight in the reserves around Whakatāne. A big thank you goes out to Jamie Rhodes, who endeavours to underplay the hard work he does. Russell Ingram-Seal is a longtime volunteer. 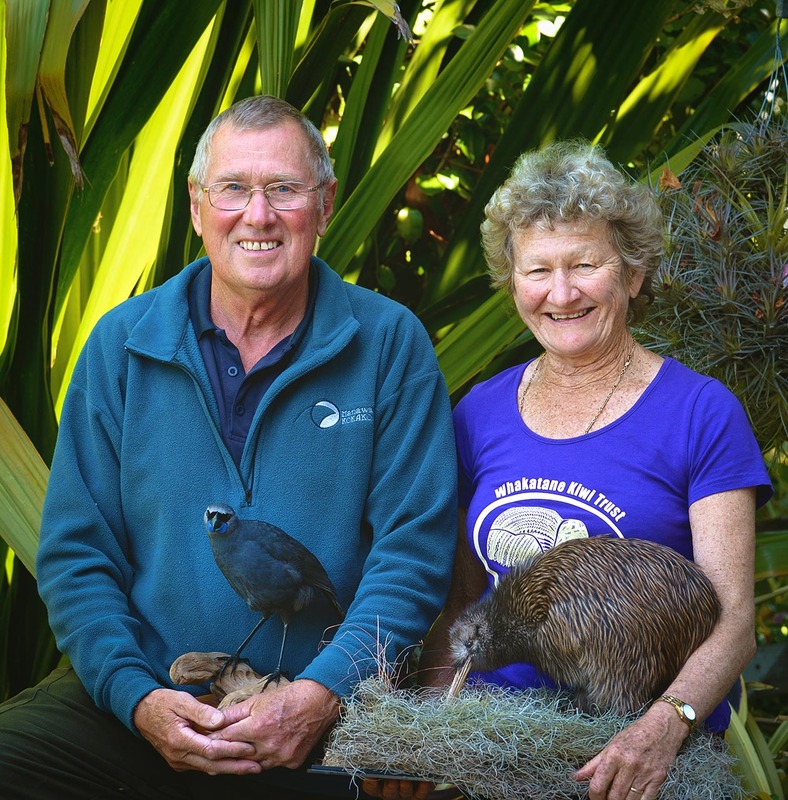 He started trapping, track clearing, collecting eggs and taking people to hear kiwi in 2007. In 2010 he became a Trustee and officially set up and led the ‘Night Walks’ for people to experience kiwi calls and the bush at night. 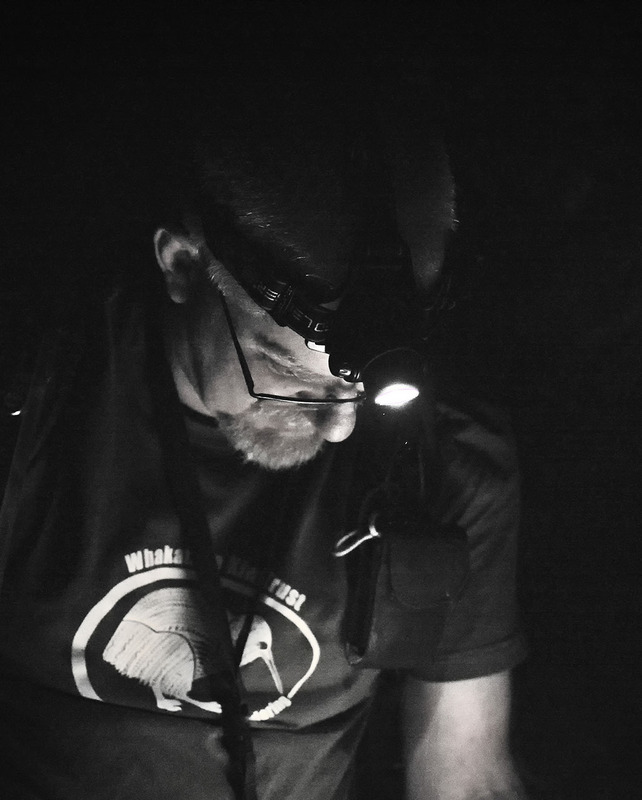 These Night Walks take place between April and June during the kiwi breeding season. Russell switched roles from Trustee to Treasurer for a couple years; then in 2014, Russell became part of the operational team and is now the team leader for the Night Walks. Russell has spent a generous amount of time coordinated a his like-minded team of volunteers and has been passing on his knowledge to them as well. Russell is very passionate about conservation, NZ invertebrates, lizards, bats, and birds. He enjoys learning about and showing people NZ fauna and flora at night. He has recently developed an interest in night-time macro photography. Similar to kiwi, Russell is rather nocturnal and not generally seen in daylight. If you are interested in volunteering your time for night walks and working with Russell, please get in touch using our website contact details. Both happily retired! Now our time is spent helping to support and protect this amazing Kiwi icon… the North Island Brown Kiwi. This involvement has gradually found a way to take over our lives a bit….. but we wouldn’t change a thing! We work together with the Kiwi management Team to ensure our precious KIWI population continues to thrive and grow…. and we love our tasks. Initially we started in 2010 as very naive “chick pingers” and gradually got hooked as we watched and learned from our incredible team of Kiwi handlers. We surely are lifelong learners!!! An added bonus being, that son Jamie is a trapper and Tracy, Emmerson, Jordyn are also involved and keen to lean and be a part of the trapping scene and kiwi monitoring. Sue’s Task as Team leader. My task is to co-ordinate the chick minders. We currently have a great team of very dedicated volunteers (mostly retired) who go out on a regular basis to check where our monitored kiwi are, to confirm they are alive, collect the data of the kiwi dads incubating and put all their data on an App. It means our kiwi with transmitters are monitored very 2 days. Yep!! An awesome team. And there is always room for new recruits too. Education side of Kiwi Mahi… getting the message out there to the schools, to ensure the next generation are informed of the struggles our kiwi have to survive. Ken and Bridget wander off happily with a bunch of school children to follow the kiwi tracker and to learn about all things Kiwi. Ken is also heavily involved with trapping, wasp control and is a member of the Halo team and a Trustee on The Manawahe Kokako Trust.